Not enough is being done in schools to highlight careers in trades such as construction, a new report has warned. The review of vocational qualifications also said the range of courses on offer was "confusing" and they often do not prepare students for the workplace. The regulator, Qualifications Wales, said broader and simpler qualifications are needed. Recent research suggested the building industry in Wales is set to grow faster than any other part of the UK. The review looked at whether vocational qualifications for the construction industry meet the needs of employers and learners. Cassy Taylor, of Qualifications Wales, said new qualifications were needed to provide a "clear route" for young people at 16 moving into apprenticeships as soon as possible, because employers wanted them to be able to learn skills on the job. "We're also asking Careers Wales to look at promoting the industry more to young people... so [they] can see the real opportunities for a very dynamic and growth sector in Wales," she added. Lynsey Davies, 36, from Swansea, loved helping her uncle mix concrete when she was a child. But she did not think about a career in construction until she was looking after her baby on maternity leave. She settled on a career in plastering and did her Level 1 and 2 apprenticeships. It was at this point that she realised a Level 3 technical apprenticeship opened up a raft of opportunities across the industry. Justin Moore, Welsh operations director at construction company Bouygues, said the industry in Wales was buoyant but with skills gaps for ground-workers and dry-liners, who fit plasterboard. "If we can't get the workforce, obviously work can't be done," he said. "We quite often change the way we build a project or the materials we're going to use in line with the skills that are available." A consultation will now open on options for reforming the system. The latest forecast by the Construction Industry Training Board (CITB) on the building industry in Wales estimated an annual average growth rate of 4.6% - more than triple the growth of the national UK average of 1.3%. 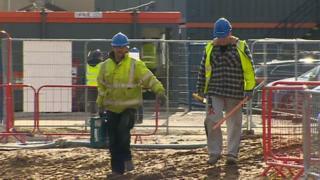 This means Wales will need another 2,450 construction workers across different trades each year for the next five years.